I’m not sure what it is, but there’s just something about covered wagons that naturally draws children in. 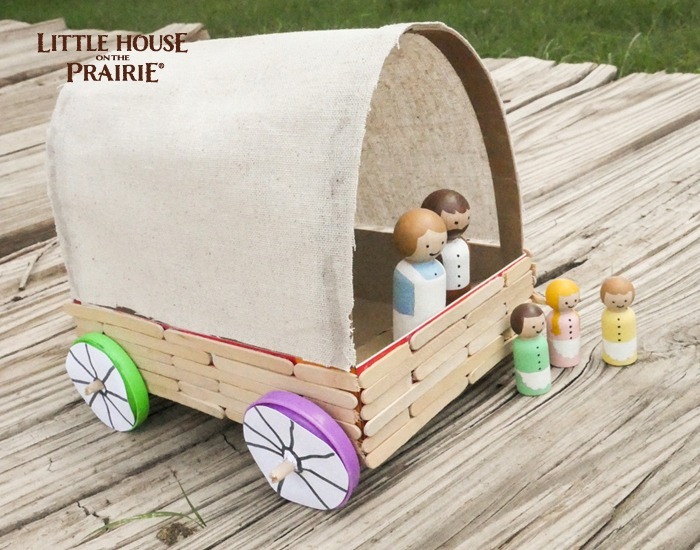 With a real fabric roof and turning wheels, my kids absolutely loved making this recycled covered wagon for our Little House on the Prairie® Wooden Peg Dolls. We had really great discussions about what it would have been like to travel in a wagon, potential dangers we’d have to watch out for, and what toy they would bring if they were only allowed one. The emphasis Laura Ingalls Wilder gave to education throughout the Little House books is derived directly from the value she and her family placed on education. My kids were so busy enjoying their newly built covered wagon that they didn’t even realize they were also learning during the whole process! It is always a bonus when you can incorporate education into fun homemade crafts. Step 1. 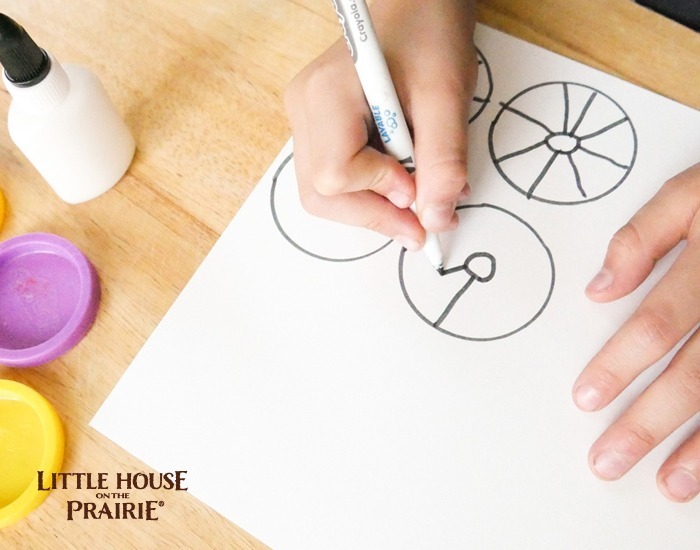 Using the lids as templates, draw wheels on white cardstock. 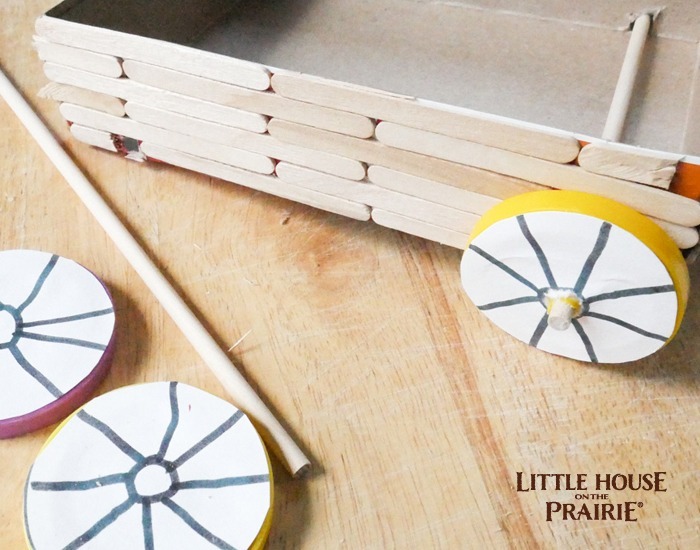 Cut out each wheel and glue it in place on each individual lid. Set aside to dry completely. Step 2. 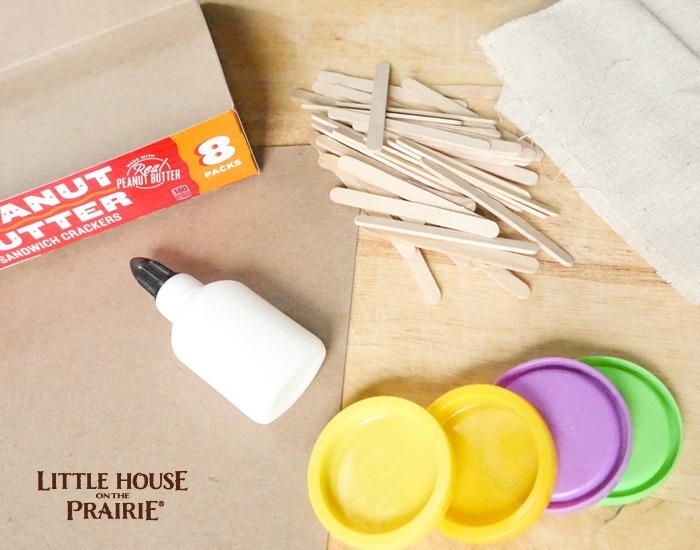 Spread a layer of glue on one side of the cardboard box and apply the wood craft sticks. 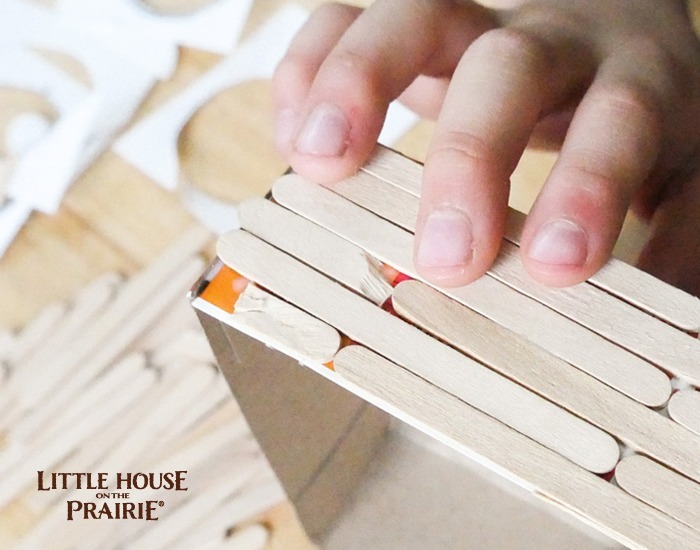 We used miniature craft sticks, but you’re welcome to use the traditional size. You can either place them equally side by side or alternate placement as we did (see photo below). Make sure to leave a little space at the bottom to insert the dowel rods, which will serve as axles for the lid wheels. Step 3. 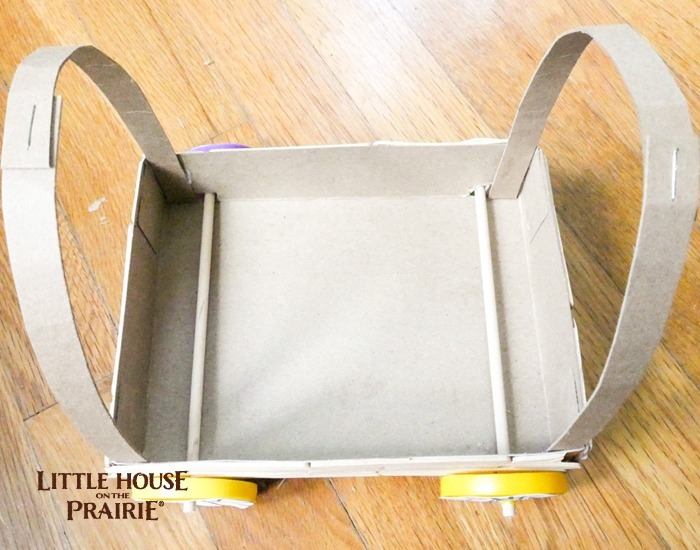 Use scissors to cut a small hole on both sides of the cardboard box to insert the dowel rods axles for the wheels. Carefully cut or punch a hole in the center of each plastic lid (i.e., wheel) and slide the dowel rods through. Place in wagon holes and secure in place with another wheel. Step 4. Cut two thin strips of cardboard to hold up the fabric cover. 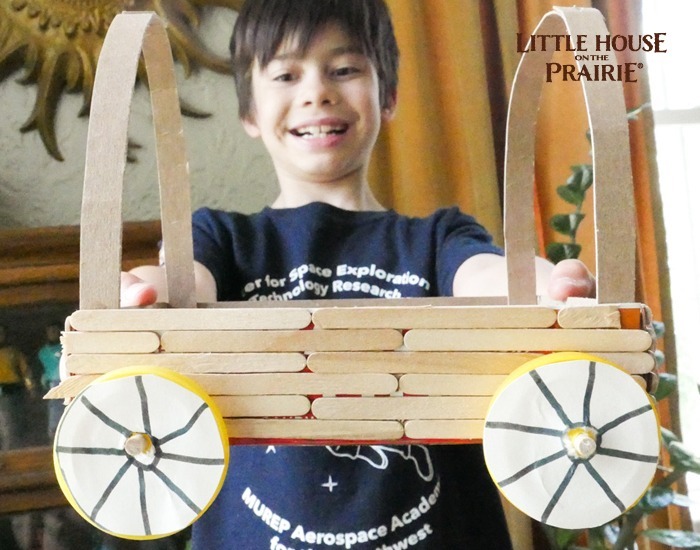 You can staple two pieces of cardboard together if you want to give your covered wagon a bit more height. Add glue to the ends and press until adhered to the inside corners of the box. Step 5. Squeeze glue onto the cardboard strips and press fabric in place. Once dry, you can trim away any excess fabric. 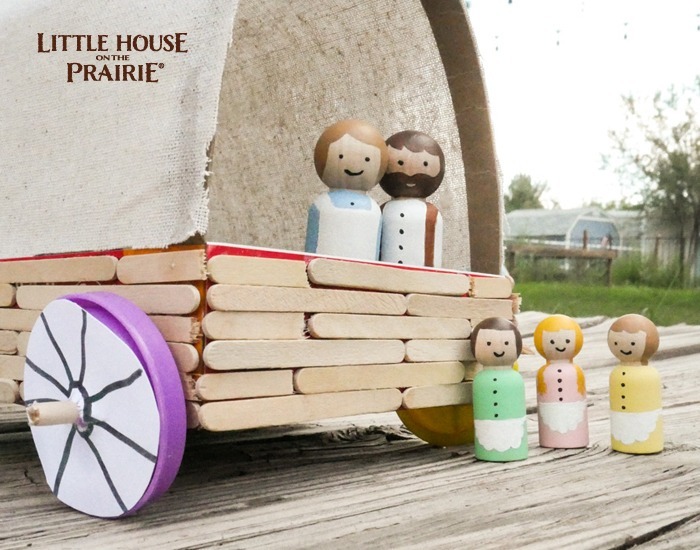 We hope you enjoy your delightful covered wagon that is perfectly suited for your charming Little House on the Prairie® Peg Dolls. Let the frontier adventures begin! 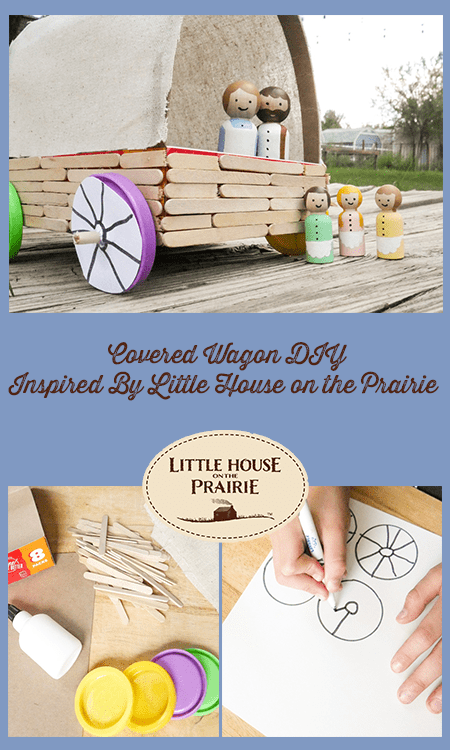 Be sure you subscribe to the Little House on the Prairie newsletter for more ways to bring these stories to life for your family. 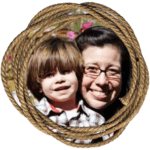 Vanessa Brady is the mother of two little boys and is an unabashed craft junkie. She is passionate about sewing, crafting, her children, and business. Find her original crafts at Tried and True blog. Um…….. well see I’m new here so um…..yeah,…..Where do we sit? Said Laura when she first attended school. i want to do this so bad!! !